In 2016, the National Parks system celebrated its centennial. During 2017, Denali will mark its 100th birthday. When founders created it as a refuge to protect Dall sheep and other wildlife, it was merely trackless wilderness. Now it’s a place that visitors enjoy and through its Murie Science and Learning Center is known for its scientific research and field learning experiences. Denali National Park and Preserve is located in the center of Alaska, 240 miles north of Anchorage and 120 miles south of Fairbanks. 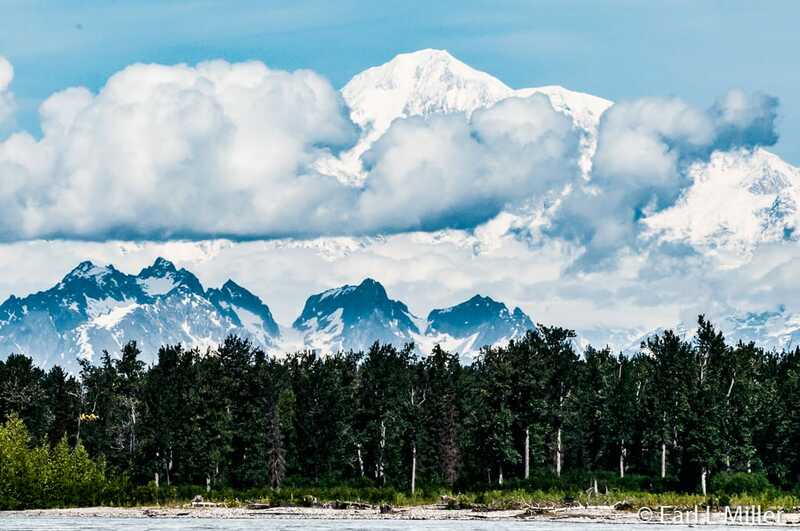 Although its centerpiece is Denali, 600,000 visitors annually also come to view wildlife, amazing scenery, and six million acres of wilderness. While the park never closes, the season to visit is mid May through September since bus tours and most visitor centers do shut down. Seeing the mountain is a hit and miss situation with only 30% of visitors able to view it. Since its height is 20,310 feet, it makes its own weather. Viewing animals depends on the weather, season, time of day, and animal activity. The hope is to see the big five: caribou, wolves, Dall sheep, grizzly bears, and moose. It is wise to bring binoculars and a strong telephoto lens since animals aren’t usually close. Exploring Denali takes a minimum of two days. Use one day to take a tour or shuttle. Spend the other checking out the multiple visitor centers near the park entrance or taking advantage of activities offered nearby such as rafting and flightseeing. 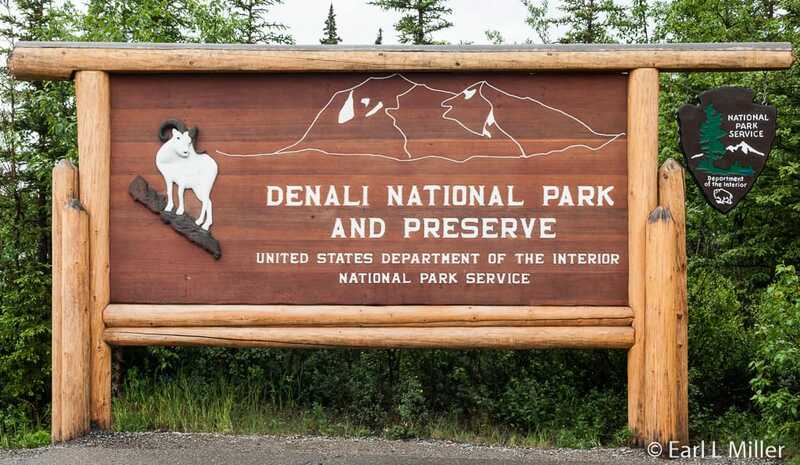 Visitors are only allowed to drive the first 15 miles, which are paved, on the 92-mile Denali Park Road. It begins at George Parks Highway and continues west, ending at Kantishna. For the rest of the park road, everyone must take a shuttle or tour bus to see the park. The remaining route, constructed between 1923 and 1938, is gravel and is NOT for those who are afraid of heights. There are several road portions running alongside sheer cliffs, dropping hundreds of feet at the edges. No guard rails exist on this mostly double lane road. Drivers are carefully trained in navigation procedures for handling the mountain road and curves and yielding the right-of-way to oncoming buses and park vehicles. A reason why the road isn’t paved is because the permafrost and the freeze-thaw cycle would make it too costly to maintain. Other explanations are crowd control and protecting the wildlife. The road was built as a spur of the railroad in 1915 to make it easier to access the mines and open development. Originally, cabins existed every nine to ten miles. These were donated to the National Park Service or torn down. During the mid 1950s, Charles Wirth, who was director of the National Park Service, created a 10-year “Mission 66" plan to expand visitor services throughout the park system. He was opposed by many park allies who hated the increased development and the addition of what they considered ugly buildings. Denali naturalist Adolph Murie opposed the plans at McKinley National Park that called for widening and paving the road and the building of a hotel, gas stations, and a visitor center. He was temporarily assigned to another park. When he returned to Alaska, the construction dismayed him. Because of his protests, the National Park Service Director stopped the development. If you want to get off and hike or have time at a particular spot, use the shuttle buses. 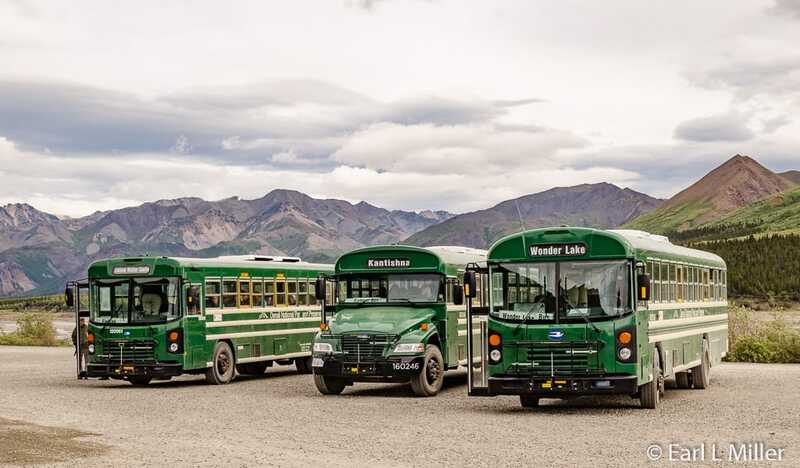 These are green school buses that let people on or off at a location of their choice. They run every 30 minutes. Since getting on the next bus depends on seats being available, plan on sometimes waiting an hour. You just advise the bus driver where you want to disembark and stand by the road where you want to be picked up. There are no shelters. The longer your trip, the better your odds of seeing wildlife. Drivers are not required to provide narration but many do. They will stop briefly if wildlife is spotted. Shuttles can take passengers to four different destinations that all offer restrooms. While adult fares apply for anyone age 16 and older, riding a shuttle is free for those ages 15 and under. All park buses, including the tour buses, are school bus type vehicles. A free Savage River Shuttle runs to mile 14.7. It serves parking and departure points throughout the entrance area. It’s two hours round trip. Toklat River at mile 53 offers a visitor information desk and bookstore. 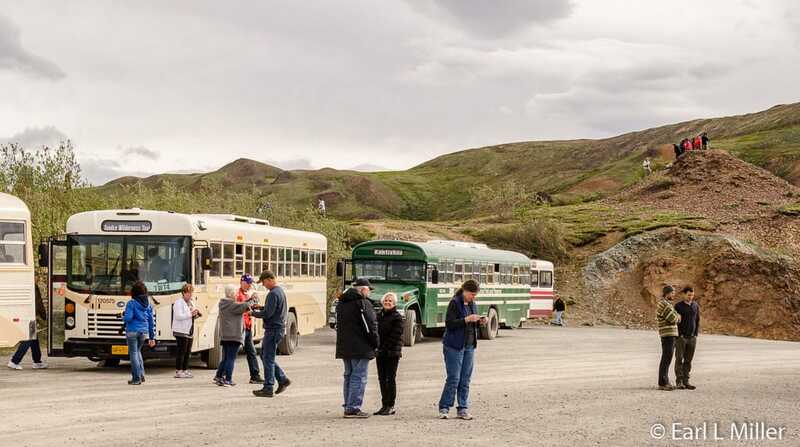 You’ll have views of Divide Mountain and wildflowers as well as opportunities to see Dall sheep, grizzlies, and caribou on your ride to Toklat River. Adult fares are $26.50. The round trip is 6-1/2 hours. 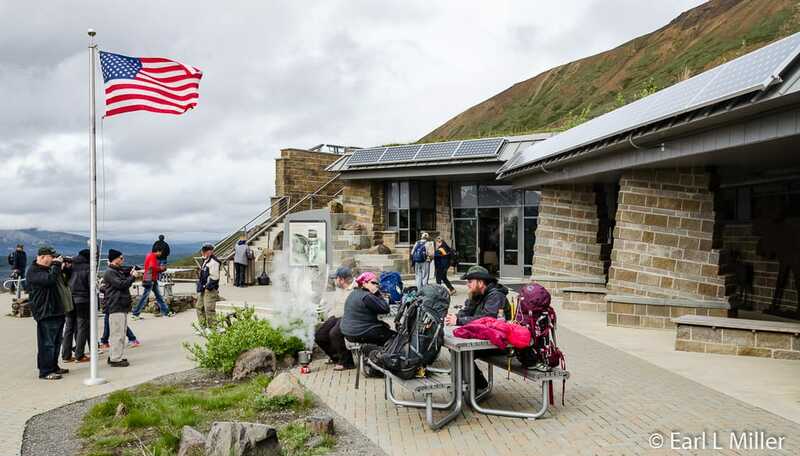 Eielson Visitor Center, at mile 65.9, also offers visitor information. It has an art gallery, a few exhibits, and picnic tables. Three hiking trails leave from here. On a clear day, you’ll get a great view of Denali. On the way, you might see golden eagles, grizzlies, or wolves. Naturalists lead free 45-minute hikes from here at 1:00 p.m. Shuttle adult fares are $34.00. It’s an eight hour round trip. Wonder Lake, at mile 84.4, also offers picnic tables with views of Denali. You may find moose, beaver, waterfowl, and blueberries here. Adult fares are $46.75. This lasts 11 hours round trip. Kantishna, at mile 92.4, is primarily a destination for lodge visitors and backpackers seeking back country access. Adult fares are $51. The round trip is 12 hours. Another choice is to take one of the three narrated bus tours. In 2016, these picked up at the hotels. For 2017, all departures are from the park’s Wilderness Access Center. Most cruise tours include a Natural History Tour with the option to upgrade to the Tundra Wilderness Tour or Kantishna Experience. The Natural History Tour travels 17 miles into the park, two miles further than you can drive. Its driver speaks about the park’s natural and cultural history providing an introduction to its landscape, geology, and history. Water and a snack are included. This trip lasts 4-1/2 to five hours. For 2017, the adult fare is $94.90 while the children's fare is $42.60. 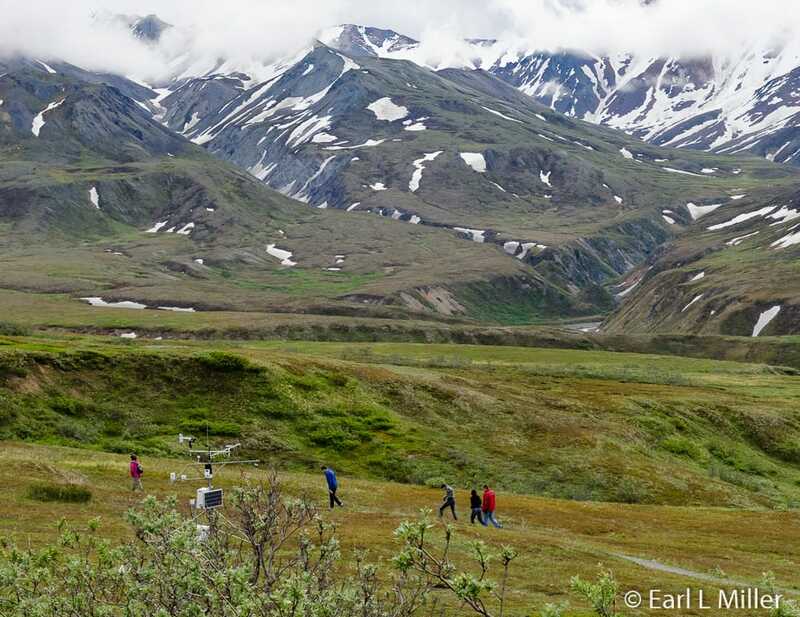 The Tundra Wilderness Tour lasts seven to eight hours. It goes to the Toklat River and provides a better opportunity to see wildlife. You’ll be given a box lunch and water. Fare is $133.30 for adults and $61.80 for children for 2017. Extending the length of the park road to Mile 92 is the 12-hour Kantishna Experience. It stops at Eielson Visitor Center for approximately 30 minutes. In Kantishna, a park ranger leads a short walk of the historic gold mining district including the Fanny Quigley pioneer homestead. This is the only one of the three tours with an interpretative National Park ranger. A box luncheon consisting of a wrap sandwich, chips, cookies and fruit is included. Trail mix, string cheese, a trail mix bar, and water are offered during your tour. It departs at 6:15 a.m. and 7:30 a.m. returning between 6:00 and 7:00 p.m. Price for 2017 is $230.80 and $110.40 for children. Kantishna was first settled in 1905 when several thousand miners had a Gold Rush there. They also searched for silver, lead, zinc, and antimony. One of those pioneer miners was Fannie Quigley. When the 1980 Alaska National Interest Lands Conservation Act passed, it expanded Denali to 600 million acres including Kantishna. A court order halted mining in 1985. The Tundra Wilderness and Kantishna Experience buses have cameras. A friend found this very convenient when viewing wildlife at a distance since the driver zoomed in on the animals. On all bus systems, you will find wheelchair accessiblity. Staff should be advised of this need when you make your reservations. With an advanced request, American sign language interpretation is also available. Adult rates for all tours include the National Park Service Entrance Fee. All pass holders prepaying the National Park Service Fee are allowed a refund. Along with a confirmation and/or tickets, a photo ID, and pass must be presented to obtain this refund at the Wilderness Access Center. 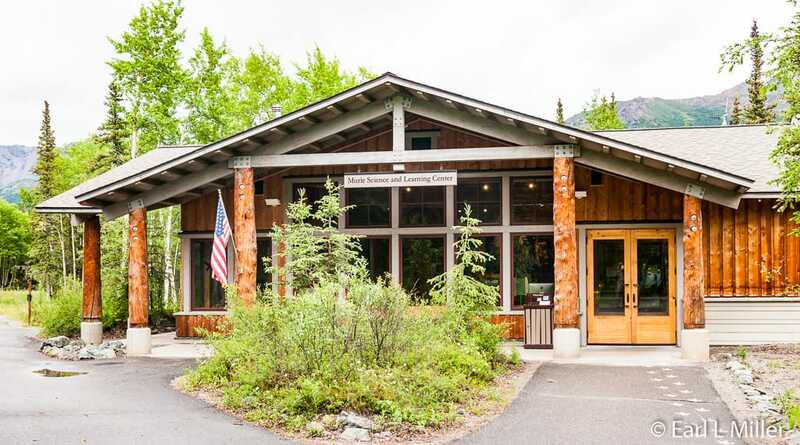 Near the park’s entrance you’ll find this center, the Wilderness Access Center, the Murie Science and Learning Center, and the dog kennels. The Shuttle for the kennels runs from here. 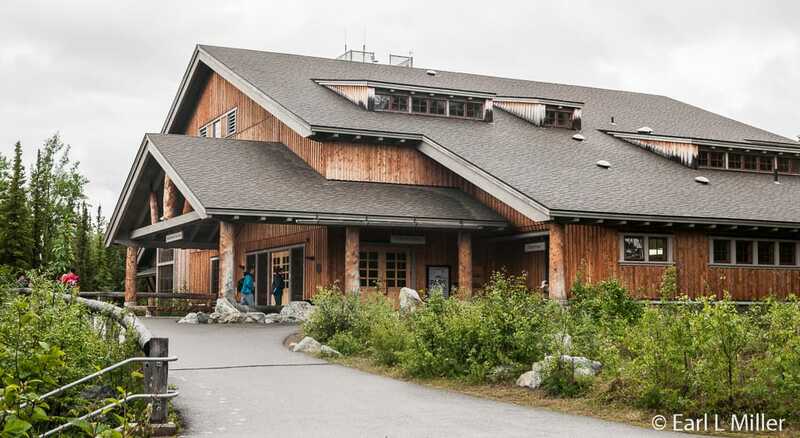 The Denali Visitor Center is the place to pick up the park newspaper, the Alpenglow, and ask rangers questions. It also is the trailhead for all of the park entrance trails. 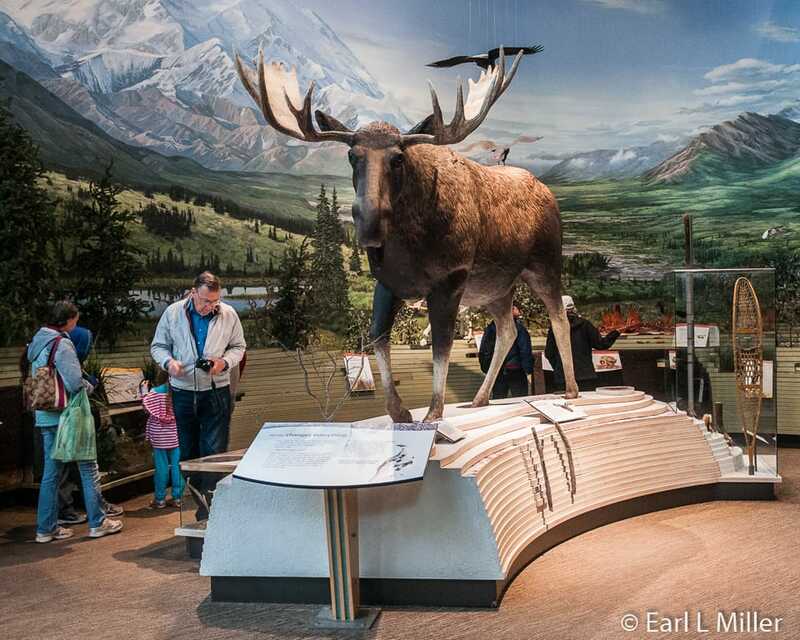 The center has exhibits about the park’s natural and cultural history on the main and lower floors that are very well done and comprehensive in scope. Plan on spending one to two hours here. It’s open fron 8:00 a.m. to 6:00 p.m. daily from May 15 to mid September. 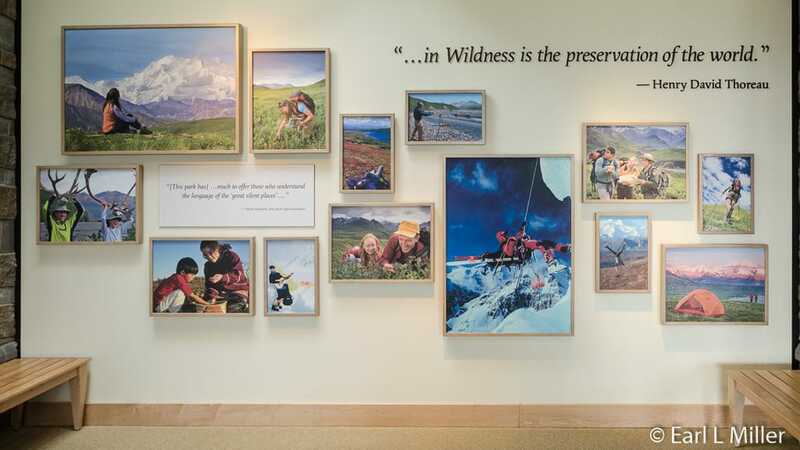 Take time to visit their theater to watch the 20-minutes video “Heartbeats of Denali” if you like good park photography showing the landscape, seasons, and wildlife. Unfortunately, it had little narration which I found to be a glaring weakness. Many ranger programs begin here. 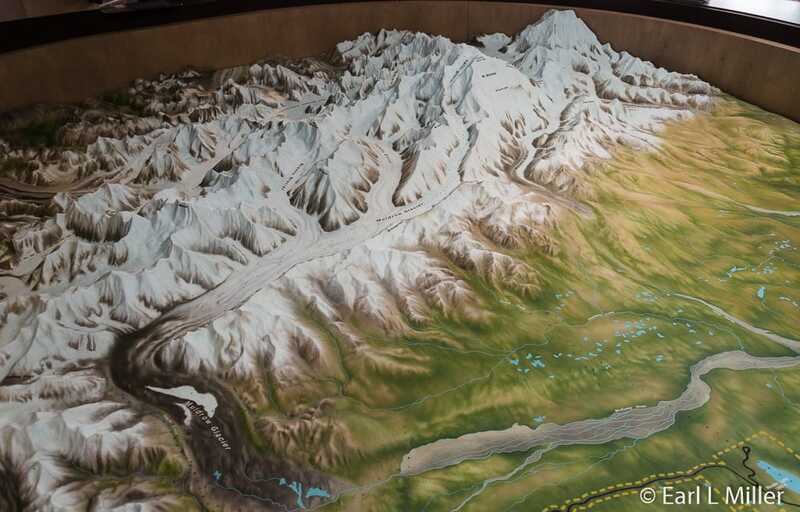 In the main room’s center is a large relief map displaying the location of all of Denali’s major landmarks. Another display is about Denali’s Ambassadors, the birds who migrate from Denali to other places during the winter. For example, the Arctic Tern winters in the Antarctic while the Northern Wheaters heads for the Sahara. You’ll learn the stories of individuals significant to the park. Naturalist Charles Sheldon was “Father of Denali National Park.” He made two visits to the wilderness around Mount McKinley as he was enthralled by the wildlife. On one visit, he observed the Dall sheep for an entire year. When he returned to New York City, he contacted the Boone and Crockett Club including one of the founders, Theodore Roosevelt. Members of the Club went into action while Sheldon moved to Washington to promote a bill to make Mount McKinley a national Park. On February 26, 1917, he personally delivered the bill to President Wilson for signing. In the 1920's and 1930's, many Dall sheep perished because of wolves. In 1929, the park considered a wolf kill program to protect the other animals. Adolph Murie conducted park research between 1939 and 1941 on wolves. He studied 1,174 wolf droppings identifying the plants, hair, and bones it contained. He walked 1,700 miles to study 829 Dall sheep skulls to determine each sheep’s age and health at death. He determined wolves were not detrimental but were preying on sick and old animals. This enabled park managers to eliminate predator control at this park. Fannie Quigley, who lived from 1871 to 1944, was one of the pioneers and miners who lived in the Kantishna area. She died in the cabin that is visited on the Kantishna park tour. In Kantishna, she became a legend. “Her ability to work as a man - hunt, kill, skin, butcher, park, and cache her own game, embroider like an artist, and entertain like a queen spread her name in books and stories.” Fairbank Daily News Miner, August 1944. 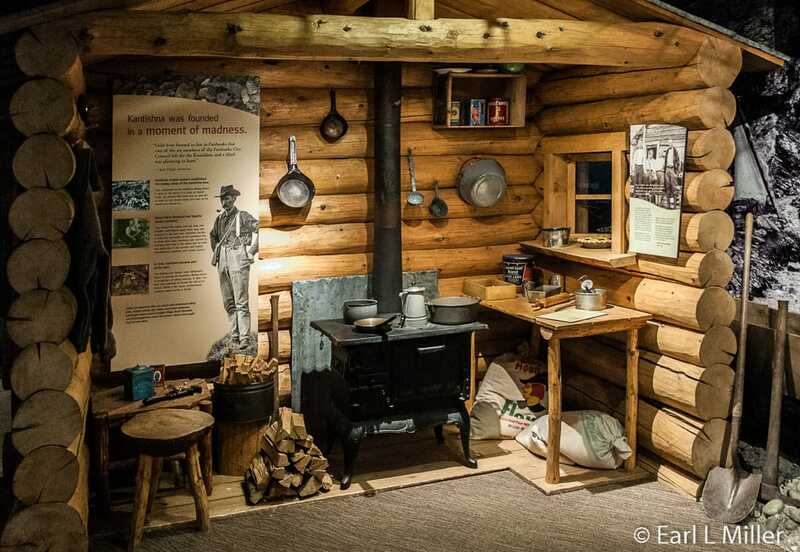 You can see a replica of her cabin at this visitor center. On the lower floor, you’ll find out about Harry Karsten, the park’s first superintendent. He stopped poaching, instituted dog team patrols, established the park road, and welcomed the first visitors. Karsten was one of a party of four who was the first to reach Mt. Denali’s summit. You’ll find models of a moose, bear, and wolf. 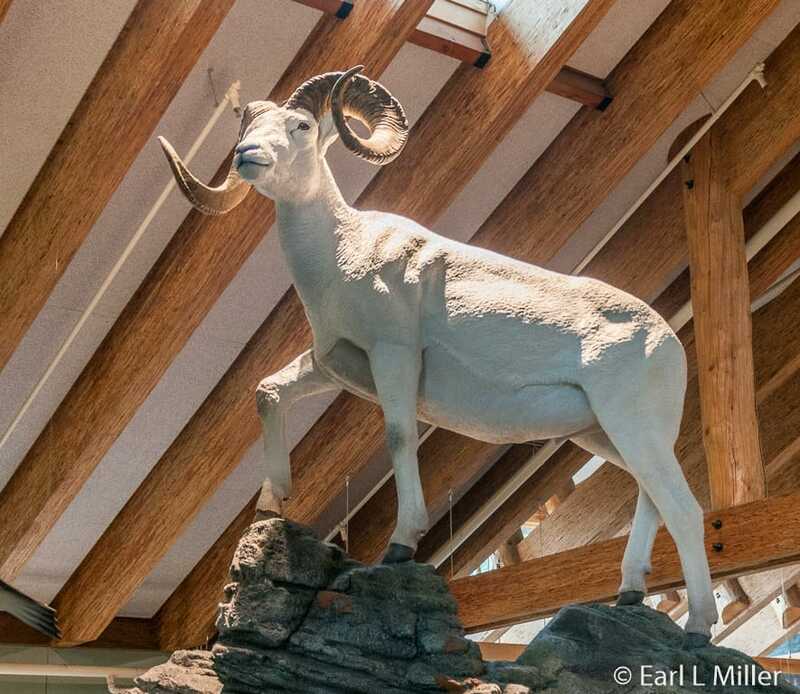 These and the main floor Dall’s sheep specimen grab attention. You’ll also learn an eagle's nest tells you what the bird had for dinner. This area also has information about the park’s geology such as its faults and glaciers. In the park, you’ll see examples of U-shaped valleys, erratics, and kettle ponds such as Wonder Lake. A major exhibit on cultural history has short videos on the Athabascans, who were the original inhabitants, and the park’s early visitors. It covers the scientists who study how Denali is changing and protecting the park from harmful change and the pioneer miners. The first visitors to Denali came on a pack train. The Alaska Railroad brought people later to the McKinley train station just outside the park. From 1923-1939, they proceeded to Savage Camp from the train, stopping first at the small headquarters building and the dog area. Most stayed a day or two. In the park, they traveled by automobile, tour bus, plane, or pack train and saddle horses. It cost $25 for three meals, lodging, and transport to and from the railroad station. The camp could accommodate 100 people overnight. They almost always saw Dall sheep, foxes, and caribou. They had flightseeing and horseback riding to Igloo, Copper Mountain, and Toklat River. The season was for 105 days with the mountain visible 60 to 67 days. Mining occurred in 1905 in the Kantishna Mining District when prospectors staked a claim at Glacier Creek. No land was left to stake six months later on the richest creek so most prospectors moved on. The 30 who remained dug deeper for minerals. During the early days, they traveled to the site by overland routes during the winter and by waterways and trails throughout the summer. They hosted mountaineers, scientists, and tourists. Names such as Quigley Ridge, Busia Mountain, and McGonagall Pass honor these pioneer miners. The first miners looked for placer gold. They shoveled tons of rock and gravel into sluice boxes which they flooded with water until either the gold settled or it escaped. Later they tunneled into the rocks seeking gold veins. They had numerous risks. The gold mines could collapse. The price of gold fluctuated. Sometimes their transportation costs were more costly than a load was worth. Transporting the gold was difficult since the park road didn’t exist. Miners had to access Kantishna from the north via steamer, pack horse, or sled. When the railroad was completed in 1923, it helped matters. Unfortunately, by then, production was small. From 1905 to 1978, the total value of gold, silver, lead/zinc, and antimony was worth $50 million in today’s dollars. This is the location to pick up tickets and tour buses and one place to catch all the shuttles except for the dog kennels. It has a coffee bar, small gift shop, and a theater. You can watch an 18-minute video titled “Across Time and Tundra.” It has excellent historic footage of the park’s first visitors and the accomplishments of the early superintendents. ​Open May 19 to mid September each year, its hours are 5:00 a.m. to 7:00 p.m. for bus departures and coffee and 7:00 a.m. to 7:00 p.m. for tickets. After 7:00 p.m., tickets can be picked up at the mercantile at Riley Creek Campground until 11:00 p.m. Hours may vary during shoulder seasons. This building serves as Denali’s visitor center during the winter. It also contains interesting displays. Daily hours are 9:00 a.m. to 4:30 p.m. 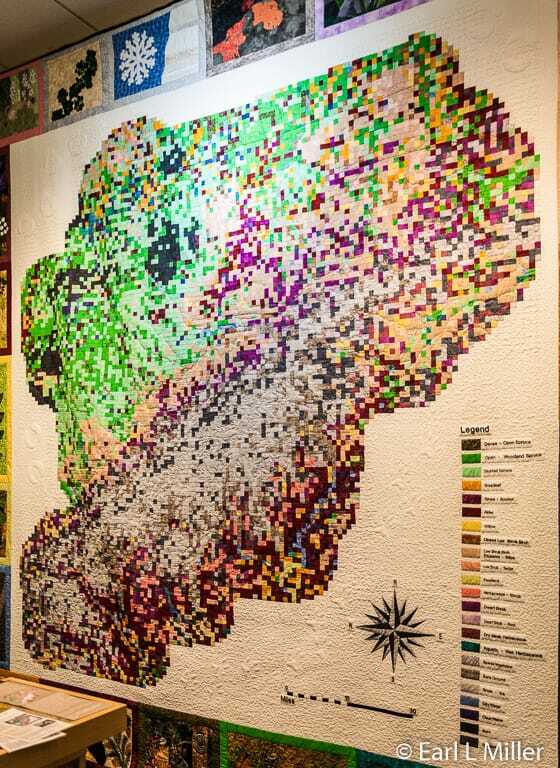 The huge quilt on the wall titled “Denali’s Landcover Quilt” is a highlight. 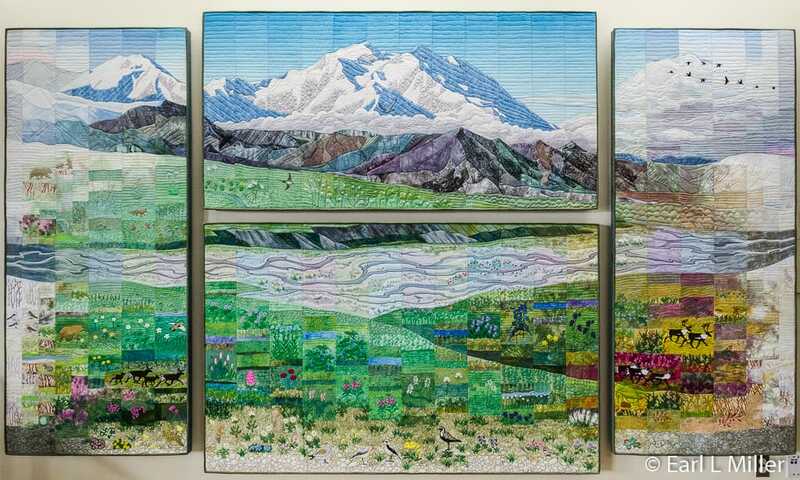 It was created in 2006 by the Denali Quilters Guild. 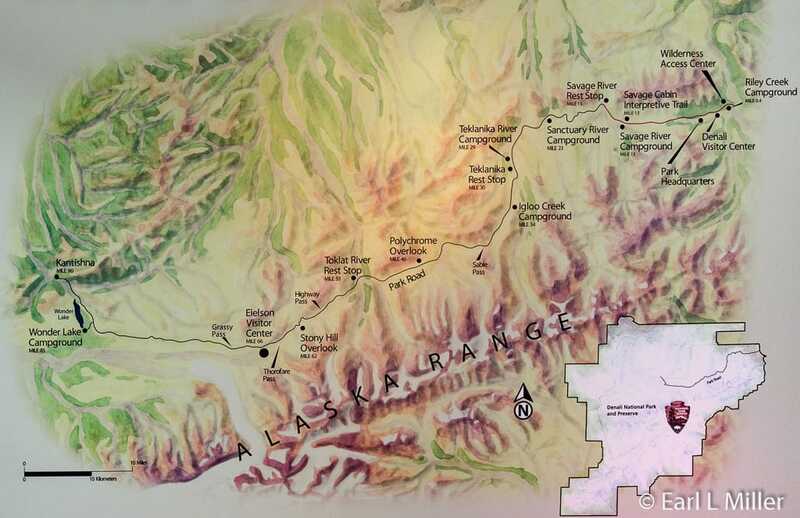 The map portion is based on a satellite image of the park’s six million acres. Its 23 landcover types are shown as different colored pixels. The fabrics match the colors park staff selected when they classified the composite image into landcover types. The 22 blocks surrounding the map depict close up selected park plants, cover features, and animals. Each quilter decided what to portray in their border block. The machine quilting outlines the park’s boundary, major river drainages, and topographic lines. It also shows caribou and wolf tracks which are two animals not portrayed in the border blocks. 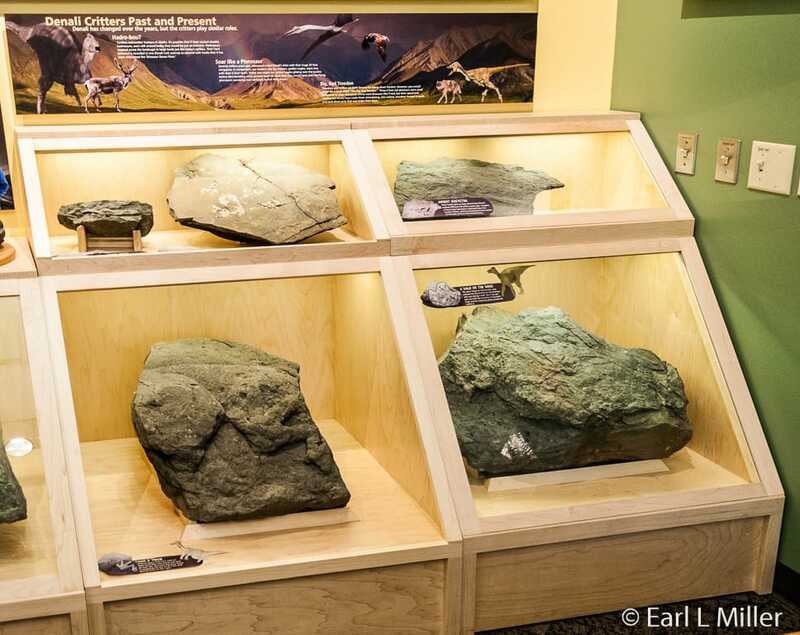 One display is on the dinosaurs that roamed the area. 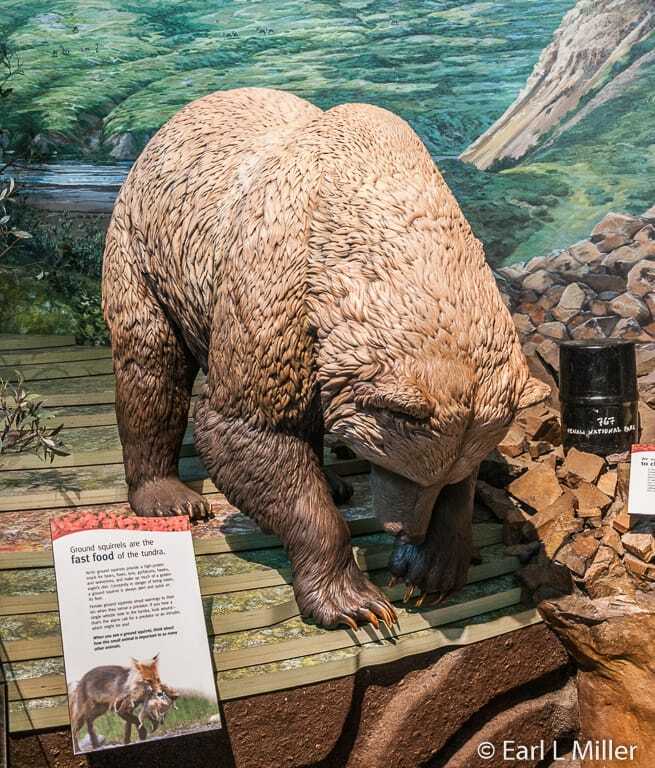 Besides a large mural of these animals, visitors find several actual tracks and footprint fossils that are 60-70 million years old. You’ll find from modern days a moose skull and antlers and caribou antlers. 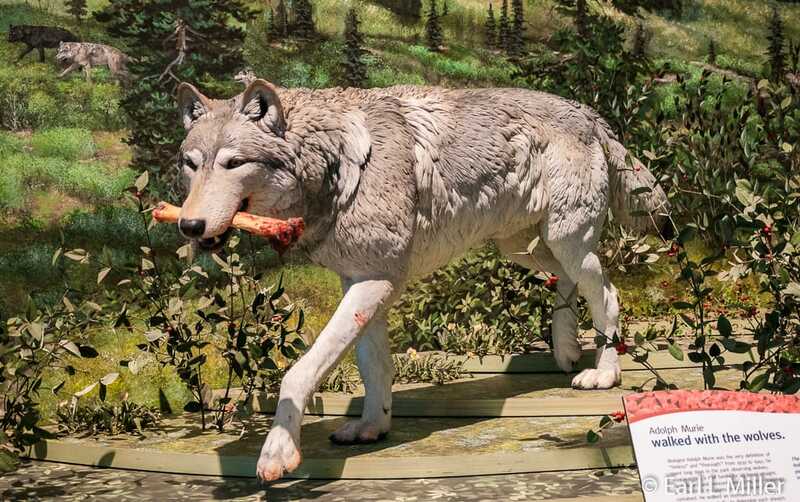 A highlight is a wolf exhibit consisting of an actual wolf skeleton and pelt. The skeleton was put together by Cantwell School students which numbers less than 20 pupils. They deskinned the animal, boiled the bones, and then assembled them. 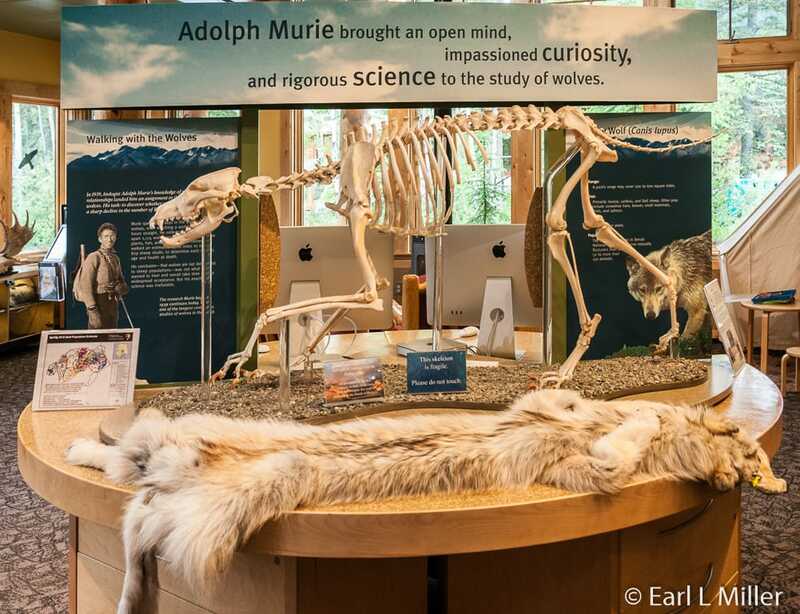 Information cards are on Adolph Murie’s study and wolf facts. In the park, 50 to 75 wolves exist. Murie Science and Learning Center promotes scientific research and education through field trips, youth camps, and courses. They run science classes on different subjects from their center where a maximum of 10 at a time study while living in tents for three days. There are only three ways to reach this center. You can take a shuttle, go on the Kantishna Bus Tour, or stop via the Kantishna Wilderness Tour we took. 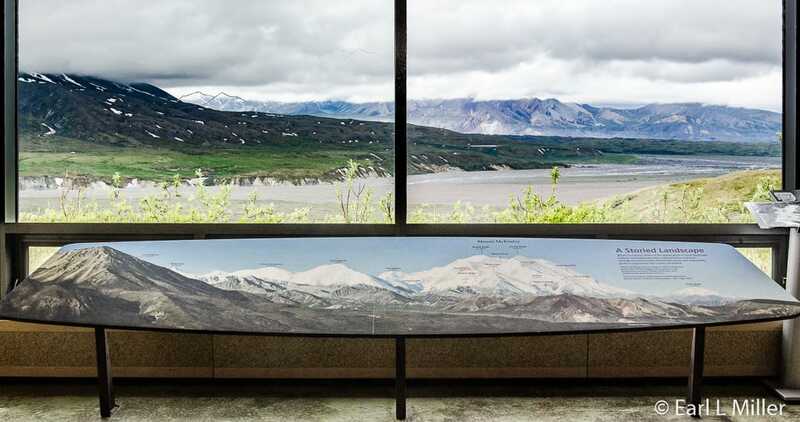 It is worth a look for its ranger-led programs, small art gallery with other exhibits, and views of Denali and the Alaska Range. It has no food service or bookstore. Its hours are 9:00 a.m. to 7:00 p.m. from June 1 to mid September when it closes. Exhibits cover a variety of subjects. 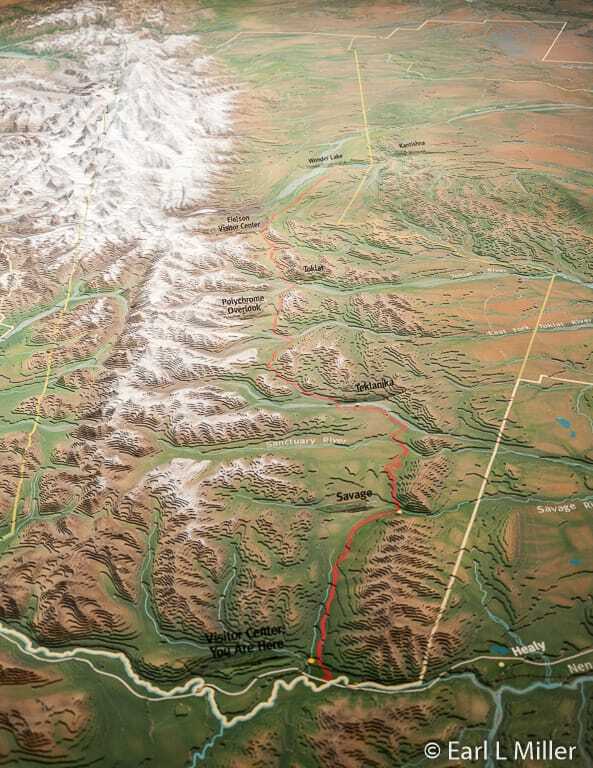 You won’t miss the large relief map which details Denali. 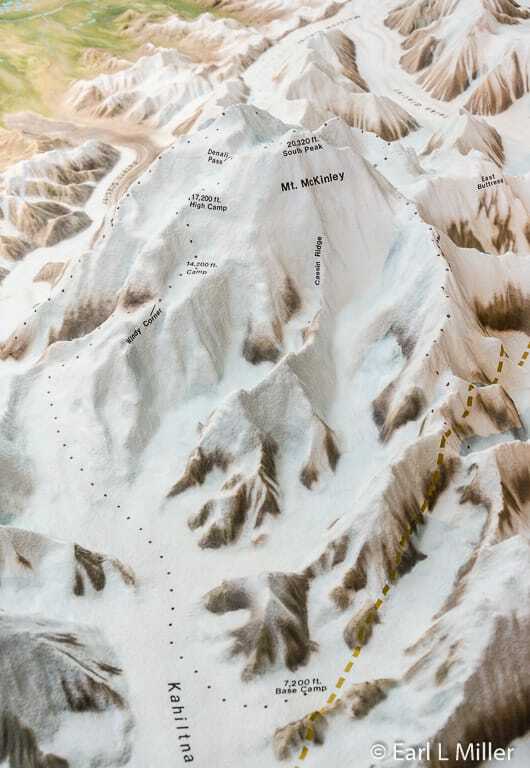 The map lights up the park’s features and what trails the various climbers followed. Displays also exist on plates and glaciers, what is subarctic survival, and how the tundra is a tight- knit community. Look for the four quilts on the back wall titled “Seasons of Denali” by Ree Nancarrow. They depict each season of the year. 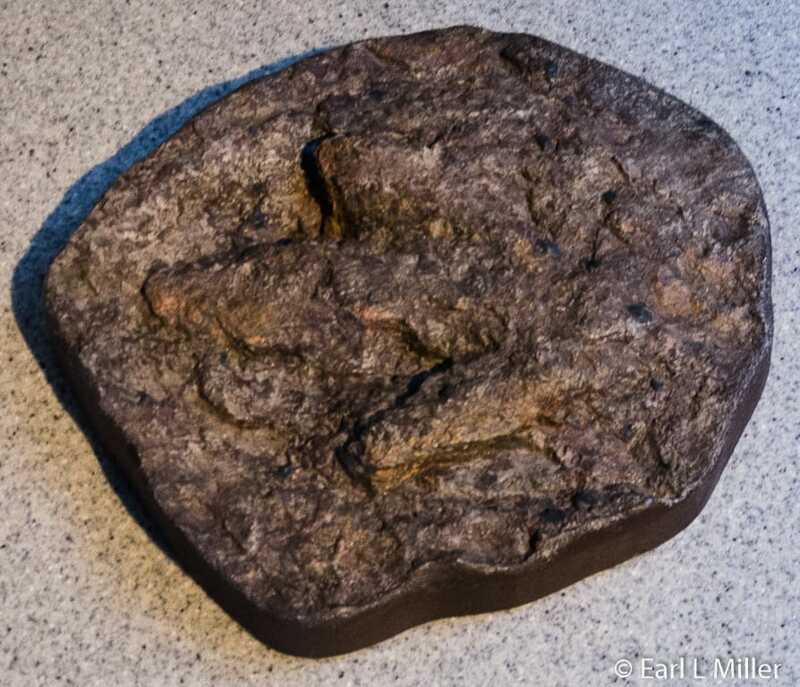 The dinosaur footprint cast was from a 200-pound Theropod walking on its hind legs. It made an impression in the sand that became a fossil. Scientists discovered the footprint in 2005 and removed it from an eroding river bank. Those on CruiseTours have their hotel included at Denali. We stayed at Denali Bluffs which cost $895 for three nights. The room was so small that we couldn’t lay out our two large suitcases and there was no room at the sink to keep cosmetics and medications. Our room had two doubles. They do have a snack bar that is open for breakfast. We only ate one dinner at their restaurant since they were so high priced. For a cup and a bowl of chicken rice soup, some chips, and two ice teas, it was $26. This is three star lodging at a five star price. I do not recommend staying here. If you have a car, go to Healy. It is ten miles from the park but worth the drive for the money you’ll save. We had friends who found Totem Inn to have clean and comfortable rooms. Their summer rate is $150 for one guest and $160 for two for one queen bed or two doubles including a hot breakfast, wifi, a refrigerator, and a microwave. It has a restaurant serving home cooked food. We had delicious cheeseburger and salmon meals for a total of $24.75. Nearby is the popular Rose’s Café which doesn’t look like much from the outside. We tried it for breakfast and found huge portions, good food, and fast service. They also serve lunch and dinner. It is essential to book in Denali and Healy more than three months in advance in order to get your choice of rooms. We booked in March for June and found selections very limited. Flightseeing is very expensive but recommended by the guidebooks if you can afford it. We didn’t do it as we preferred to explore the park for two days. Most of the firms that do this are located in Talkeetna. Denali Air leaves from a private airstrip south of the park entrance. The firm focuses on the park and immediate area. They charge $399 for 60-70 minutes and $315 per person for 45 minutes. 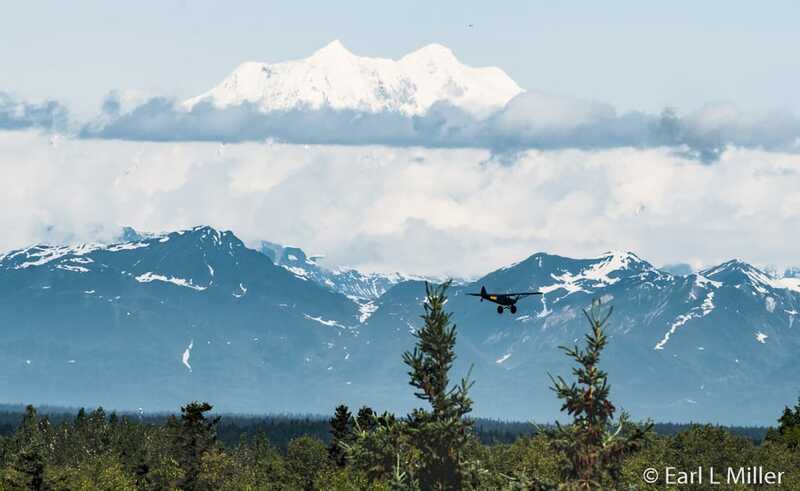 Denali Summit Flight takes off from the Healy Airport. They charge $429 per person to fly over Mt. Denali’s summit. Their flights are an hour and a quarter long. Fly Denali is the only one at Denali offering a glacier landing. For a two hour flight, they charge $524 per person and $393 for children ages 10 and under. You are on the glacier for 20 minutes. Several Denali firms offer rafting or kayaking tours on the Nenana River. These range from a couple of hours to a full day. Rides can be either running white water or mild. Some firms offer both kayaking and rafting. Rates seem to range from around $94 to $134 to $187 depending upon whether it is for a few hours, to a half day, to a full day. Hiking any of numerous trails, bird watching, fishing, photography, camping, and cycling are also popular.